After almost 30 years at Pappagallo’s Satellite Beach it’s easy to get used to what we do from day to day. I’m not going to say it gets easy because lord knows there’s always something to be done. Pappagallo’s Satellite Beach never will sacrifice quality for a short cut. But after all these years we’ve stuck to a pretty core menu with a few new dishes and specials from time to time. I’d say a good 80% of our guests don’t even look at our menu. They’ve been coming for years on the same night of the week and they know what they want before they even sit down. That’s called a routine and we at Pappagallo’s Satellite Beach are perfectly happy accommodating these requests and they represent a major part of our sales. As previously mentioned we run specials on certain menu items that only appear in store. The conversation usually goes something like this,”that Parmesan crusted chicken special sounds great but it’s Tuesday and I get my calzone on Tuesday.” This has been happening for years now and I in no way consider it a problem but we were left with trying to keep the classic menu while trying something new. About this time some friends persuaded us to go to another restaurant with them to try something called a “wine pairing dinner.“ The idea is to have a set menu for a set price. A wine consultant comes in as a guest speaker and explains to our guests the different wines offered as well as how they were paired with a particular dish. We decided this was a great way to change things up a bit. We’d dress up the patio with tablecloths and linen napkins. Even dress up the wait staff a little differently and try some dishes that we have never offered. Our first wine pairing was in August, we kinda cheated a bit by offering some of our most popular dishes and have them paired with wines we don’t usually offer. I say cheated because we, meaning the kitchen, is used to making these dishes. Since we never served 35-40 people at once we really didn’t want to throw too many curve balls at once since none of us had done this before. First pairing went off flawlessly. I was really impressed with how our whole staff handled something totally new and out of our usual comfort zone. The waiters that worked that night commented that it was actually kind of nice because everyone was eating the same dishes at the same time so it gave them more of a chance to interact with the guests more than usually get to. Last night was a different twist, this time we did a Spanish theme, all wines originated from Spain and were paired with traditional Spanish dishes, all of which are not on our regular menu. It was the same game for the front of house staff but for the kitchen, it was a chance to make some dishes we don’t usually get to make and try something a little different. Pappagallo’s Satellite Beach Spanish menu was a four course meal, each meal was set with a different red wine although the dessert course was served with a champagne type white wine. First course was an Berenjena Asada, which was a thick slice of fresh eggplant grilled and then topped with a fresh tomatoes fresh mozzarella and capers. It was like a Spanish version of Bruschetta but without the bread. Second course was Patatas Bravas -red potatoes with olive oil, onion, paprika and spices served on a bed of fresh Chorizo topped with a sriracha type Aioli sauce. Third course was of course Paella, a traditional Spanish seafood and yellow rice dish, that was Nonna’s specialty and she pulled it together in amazing fashion. Lastly come our version of Flan, a traditional Spanish custard which we topped with fresh mint and a fresh blueberry. Because flan is not especially sweet we choose to add a little extra sweetness in the form of a Homemade Nutella graham cracker Churro served on the side. That definitely made the dessert sweet enough for the end of a big meal. Pappagallo’s Satellite Beach had never done any of these menu items before. Most were traditional Spanish dishes that we had to tweak a bit to appeal to our own tastes. Pappagallo’s Satellite Beach doesn’t serve anything we wouldn’t eat ourselves. I mean I’m not crazy about seafood, in fact I don’t like it at all but even I had to have small plate of paella. You know just to make sure it was good enough for our guests. The group last night was a little smaller than the first months wine pairing but everyone had nothing but positive feedback for the food and the wine they enjoyed last night. Some folks even asked if some of the new items might make the menu as permanent choices. We’ll have to see about that as time goes on but I do admit it was fun to try new dishes for a change of pace. 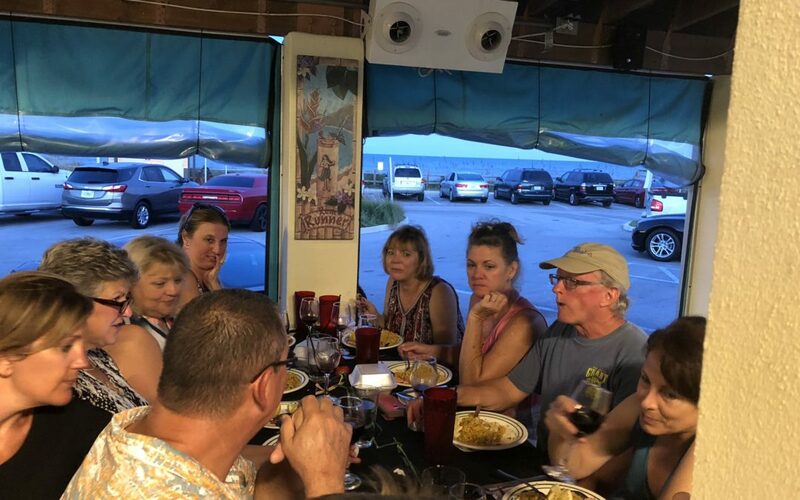 I’d say that Spanish wine pairing night at Pappagallo’s Satellite Beach went as well as we hoped our guests were very happy with their meals and the kitchen got to break out of our routine and try some things that we weren’t very accustomed to doing. Pappagallo’s Satellite Beach is trying to do this type of event once a month. We’re not really sure what the theme of the next event will be but the kitchen staff is excited to try some new recipes that break us out of our comfort zone and let’s our guests see that Pappagallo’s Satellite Beach kitchen is more than a pizza and a bunch of pretty faces. Pappagallo’s Satellite Beach would like to thank all our loyal diners who come out to try something different from their favorite Italian place. We’ll see you next month for another fun night of food, wine and great friends.